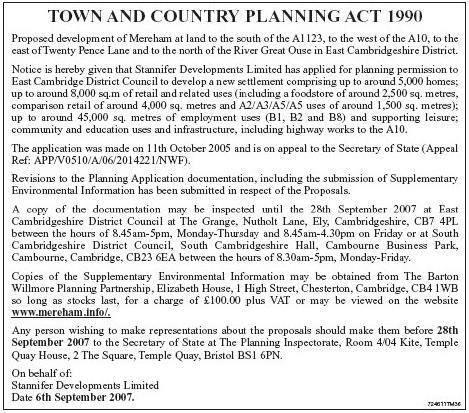 The developers have changed the plans for the A10 as of the first day of the inquiry - an underhanded trick by David Tucker Associates to remove the objection by the Highways Agency, rather than provide a safer, less congested solution to the many problems that Mereham could create if it went ahead. This isn't the first time David Tucker Associates (DTA) have changed their plans for a development at this site (or during a public inquiry for other developments) - and it shows that rather than provide a "truly independent" traffic assessment (to quote Robin Purchas, their QC), DTA will change plans to remove objectors regardless of the consequences to the people it will affect. 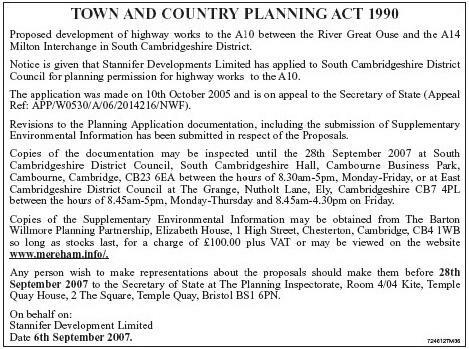 We urge you to write in and complain about the change of planning application at such a late stage, to question whether DTA are providing a "truly independent" traffic assessment or just trying to reduce objections, and if you get chance to read through the documents to provide your own opinions of the effect that increasing congestion on the A10 and increasing traffic levels on the B1049 will have to you. We also feel that we need to question whether DTA "got it wrong" in the first place, and if so whether the whole traffic assessment is now too weak to continue and should be undertaken by professionals who can do the job properly. We have seen even basics like distances and traffic counts to be totally inaccurate - yet DTA are making proposals which could ultimately cost lives. They make unbelievable claims for bus patronage - based on projects that haven't got off the ground - not on local consultation. I doubt they have ever even visited central Cambridge to see how bad the bus situation is there. Greed should never replace the wish to preserve life. Decisions made like this should be accountable. We believe that if such a poorly thought out scheme were to go ahead, any loss of live should result in DTA being held responsible - as is the case for railway maintenance. Perhaps then they would provide a "truly independent" view. Any representations must be made before 28th September 2007 - so we don't have long. We also can't believe that they wish to charge £100.00 plus VAT for the updated proposal - as if anyone would want to pay for such mindless repetition of the word "sustainable"!